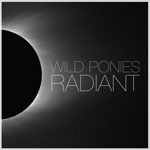 Share the post "Album review: WILD PONIES – Radiant"
Essentially a Nashville-based duo of Doug (guitars and vocals) and Telisha (bass and vocals) Williams, Radiant is Wild Ponies sophomore release, coming on the back of their well-received Ray Kennedy-produced debut Things That Used To Shine (2013). Having plunged full time into music as an acoustic duo Doug & Telisha, the couple released two independent albums before arriving in Nashville and hooking up with Kennedy. But Radiant finds Wild Ponies branching out – Doug hung up his acoustic in favour of plugging in throughout set, there is song writing collaboration with Amy Speace, Sally Barris, Jeff Barbra, Robby Hetch, Amelia White and Mariah Moore, and with just four players Megan Jane (drums) and Fats Kaplan (strings and steel) there’s a surprising amount of ‘rocking out’. ‘Born With A Broken Heart’ opens the set in quite some style, echoing The White Stripes with some powerful guitar playing and Telisha’s imposing vocals. It’s a format revisited to good effect the on commanding Jimmy Page-style ‘Graveyard Train’. There’s mainstream crossover appeal in the shimmering ‘Radiant’, the Western vibe of ‘Tower And The Wheel’, and ‘Unplug The Machine’ which echoes Billy Joel’s ‘We Didn’t Start The Fire’ (with a touch of REM), and more traditional country fare in the form of ‘Mom And Pop’ (on which Doug takes lead vocals), ‘The Night We Never Met’, and the closing duet ‘Love Is Not A Sin’. This entry was posted in ALBUM REVIEWS, ALBUM REVIEWS (Mobile), All Posts and tagged acoustic, album, Americana, Doug Williams, folk, Radiant, review, rock, singer, songwriter, Telisha Williams, Wild Ponies. Bookmark the permalink.